Outdoor living. A life in Spain. No more Siberian winters! No more snow alerts. No more traffic chaos! Read all about my view on the Artic winter. Finally, weigh up the pros and cons. And think, where would you rather be? Freezing in a savage UK winter? Or warmed by the Spanish sun, sat on an outdoor terrace? Outdoor life is a natural consequence of sunny days. It pairs beautifully with sunshine. Life moves outdoors at every opportunity with this tolerant and beautiful weather. The streets of Spain stay active for long hours. Only a siesta seems to bring quiet. Days are long in Spain. This outdoor life continues even when night falls. This is family life like no other. Babies in strollers, deep in a comfortable slumber at 11pm. Their parents slowly finish their cerveza and tapas at a local bar, gently pushing the slumbering infant. Their siblings race around a busy square, kicking a football, with no concern for tables or wine glasses. Outdoor living is an integral part of Spanish life. I remember teaching in Seville and I was alarmed that my adolescent students rarely saw bed before midnight, at first. There again, before I sound sanctimonious, I also recall UK students telling me how they usually slept sometime after 3am. But not until they’d finished playing computer games and updated their social media status one more time. However, Spanish kids spend copious amounts of time outdoors. Adults and children socialise as one large community. Consequently, I know which lifestyle I consider the most healthy for mind and body. Outdoor living! This winter of 2018 ultimately convinced me I wasn’t suited to the onslaught of this savagely cold weather. It wasn’t just one outburst of a near Siberian winter. It was three. Three! 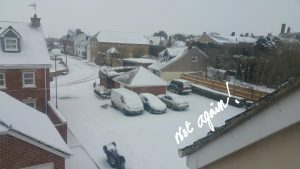 Each weekend the Met office warned us not to travel. So, I lived in PJs for what seemed forever. The third freezing event fell in what was officially Spring. It killed the daffodils. These were my one hope that warm weather was on its way. I just couldn’t stop thinking about the outdoors and sunshine. I couldn’t stop thinking about Spain. English tea shops and coffee places despite their lavish, spectacularly tall, belly busting cakes, brought no joy. Everywhere was indoors. Everywhere was centrally heated to the temperature of a hot, inferno-like oven. Maybe this hothouse was an inviting escape from the artic blasts. Perhaps not. Unfortunately, just to get to the cafes I was compelled to layer up with at least several additional clothing items. I moved slowly as I was carrying the weight of winter clothes on my body. It was a gargantuan effort just to walk along the path. The path that had hidden dangers: snow, black ice and freezing rain. In the UK, the outdoors can be painful whereas in Spain, the outdoors is pleasure! Inside the cafe, I was just sweaty and uncomfortable from the insulated layers of clothes and the intense heat. The whole idea of a relaxing coffee was scuppered by the feeling that I had contracted some type of fever with my clammy skin. The best solution was to strip off. So, I started to disengage my body from my clothes.. However, in a tiny English café, it was hard to find a place to deposit an arran jumper, scarf, hat, gloves, coat and possibly another jumper. In doing so, I made the place look like a jumble sale or TK Maxx. As a result, I lost interest in the coffee and, more traumatically, the cake! Ultimately, cafe life in Spain was so much simpler. All I had to do was find an outdoor table, read the menu and sit comfortably and happy. Thus, I pined for a café where I could sit outside throughout the year. I pined for outdoor living. This is a reason to be in Spain!